Long grasses or ornamental grasses, add a natural appearance to the landscaping and come in a wide-variety of species. These types of grasses are typically easy to grow and maintain; and come in numerous colors, heights and textures. Long grasses create yearlong interest and add an ornamental element both when growing outside or when dried and used in decorations. Giant Silver Grass, Miscanthus ‘Gifanteus’ (M. floridulus) is a warm season grass that grows well in USDA hardiness zone 4. This type of tall grass reaches to mature heights up to eight feet tall, grows in clump forming masses and prefers moderately moist to moist growing conditions, according to the Colorado State University and the University of Rhode Island. Giant Silver Grass matures into a soaring arched form that produces numerous, large feathery silver blossoms up to 10 inches in diameter. Pink Pampas, pink feather pampas or Carminea Rendatleri, is part of the group of pampas grasses (Cortaderia selloana). Native to Chile, Argentina and Brazil, pampas grasses are tall perennial grasses that develop in clumps and grow best in USDA hardiness zone 8 through 10. Pink pampas reaches mature heights ranging from six to 12 feet tall and produce green leaves and pink blossoms that resemble feathers. The showy pink plumes grow several feet over the green foliage, which makes a vivid vocal point in the landscape. Giant miscanthus (Miscanthus floridulus) ranks as one of the tallest ornamental grasses, according to Iowa State University. This warm season grass grows in clumps, reaches full-grown heights 10 to 12 feet tall and creates accent screens. The tall, bamboo-like foliage changes from a dark green to a light brown in the fall and offers an interest in the landscaping year round. 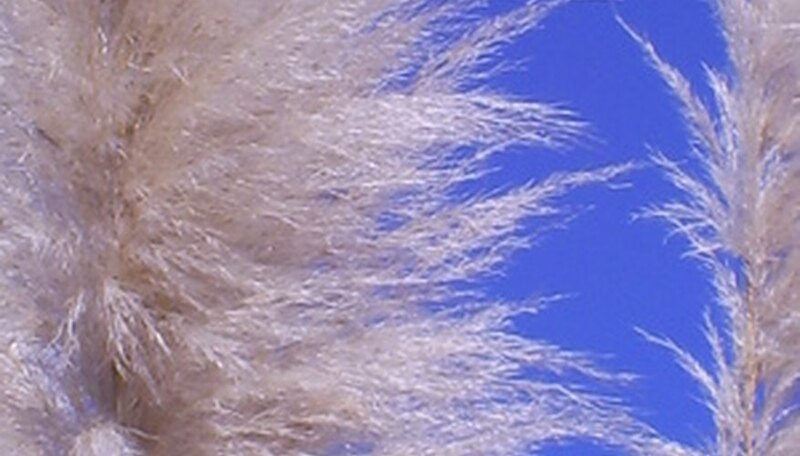 The giant miscanthus produces a white flower that extends a foot or more above the foliage.